Road Biking Utah features a mixture of well-known routes and out-of-the-way rides, some of which even Utah’s most avid cyclists may not know. The Big Cottonwood Canyon Challenge is one of the former types of ride – popular and heavily-ridden. The ride has plenty of appeal, though, in part because it is arguably the Wasatch Front region’s longest out-and-back canyon route. Road Biking Utah’s version of the ride is a 37.2-mile mountain climb and descent, starting in Mount Olympus with 4 miles of rolling hills, followed by a 14-mile climb up Big Cottonwood Canyon to Brighton, a 14-mile descent, and 4 miles of rolling hills to return to the starting point. The elevations range from 4,840 feet at the start at Mount Olympus Park to 8,730 feet at the turnaround. Please note that the highway through Big Cottonwood Canyon is subject to closure during inclement weather, although the road is plowed during the winter to enable access to the Solitude and Brighton ski resorts. Start the ride at Olympus Hills Park, located at 3131 East 4500 South in Mount Olympus (immediately adjacent Holladay). The Wasatch Mountains that form the Salt Lake Valley’s impressive backdrop are drained through several canyons. Big Cottonwood Canyon is home to two ski resorts—Brighton and Solitude—as well as plentiful camping, climbing, cycling, fishing, hiking, and picnicking. Observers of wildflowers appreciate the diverse array of plants in the canyon, including the Wasatch shooting star, which is known to grow only in Big Cottonwood. Despite the popularity of Brighton and Solitude among skiers and snowboarders, and the proximity of the canyon to Salt Lake City (25 miles from downtown), none of the 2002 Winter Olympic Games events were held here. Utah is actually home to several Cottonwood Canyons, all of which refer to the cottonwood tree. The tree has shiny (green), triangular leaves that tend to “shine” and shake in the wind. Female trees produce fluffy white seeds that resemble cotton (yet, the trees do not produce cotton). Big Cottonwood Creek occasionally flows with force, providing power and water (the canyon is a watershed) to Salt Lake Valley residents. The moniker implies that there is a Little Cottonwood; indeed, there is—it is the next most southerly canyon in the Wasatch. It is not readily clear why one canyon is “Big” and the other is “Little,” although the “Big” canyon is a couple of miles longer than the “Little” one. Big Cottonwood Canyon has been designated as a scenic byway by the Utah Department of Transportation. Big Cottonwood Canyon is also a popular route for cyclists. 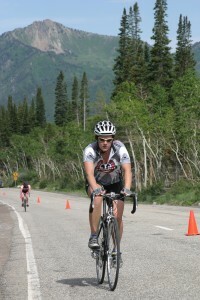 The annual Big Cottonwood Canyon Hillclimb is held during the summer (July 7, 2012). Exit Mount Olympus Park, and turn left to begin the short, steep climb to Wasatch Boulevard via 4430 South (SR 266). At the top of the climb, after crossing over the I-215 freeway, turn right onto Wasatch Boulevard. The road descends along “the bench,” with an outstanding view of the Salt Lake Valley to the east. To your left is Mount Olympus, which reaches up to 9,026 feet above sea level. Wasatch Boulevard curves to the left, and then to the right around mile 3.1. Start moving left here, in preparation for the left turn at the upcoming T intersection and traffic signal. The left turn actually keeps you on Wasatch Boulevard. Swing wide, onto the shoulder, after making the turn and begin the gentle climb to the mouth of Big Cottonwood Canyon. You are now in Cottonwood Heights (population 35,418 in 2008), one of Salt Lake County’s newest cities, incorporated in 2005. The city is home to Overstock.com and JetBlue Airways. You continue to have an outstanding view of the valley on your right. Turn left at the traffic signal, toward Big Cottonwood Canyon (SR 190), and begin the climb. From this point, the fastest hillclimb to Brighton, the turnaround point, appears to be one hour and twenty-two seconds, set by professional cyclist Jeff Louder in 2007. To your left is a parking lot that could be an optional starting-ending point for this ride. Starting and finishing at Mount Olympus Park affords those unsurpassed views of the Salt Lake Valley, however, as well as of Mount Olympus. Those views are not to be missed! The climb begins gradually; enter the Uinta-Wasatch-Cache National Forest at mile 4.8. From mile 5.9 and beyond, notice the spectacular cuts made in excavations for the highway. The Stars Station water treatment plant is at mile 6.2. Water flowing down the canyon is processed here and is consumed by Salt Lake Valley residents. Pretreated water is kept clean by prohibiting pets and other animals from entering the canyon. The climb gets noticeably steeper at mile 6.4. Storm Mountain towers to the right at mile 7.0, peaking at 9,524 feet. The grade eases while passing the adjacent picnic area, but the steep climb resumes just beyond here. A pair of hairpin curves (S-turns) follows at mile 8.4. The gradient eases at mile 9.3; the highway climbs gradually for the next 5 miles. Steep climbing resumes at mile 14.2, at Spruces’ Campground, remaining steep all the way to Brighton. The Silver Fork Lodge is on the right at mile 15.3. Silver Fork is actually a small, canyon community with a few seasonal residents. The Solitude ski area is on the right at mile 16.3. The accompanying Solitude Mountain Resort is on the right at mile 16.7. This pre- and après-ski spot has eateries, as well as restrooms. The gradient finally eases at mile 18.1, just before entering Brighton. Bear right at the Y intersection, and begin a counterclockwise, one-way loop. Refresh at the Brighton General Store at the Y intersection. The Solitude Nordic Center (cross-country skiing and snowshoeing) is on the right at mile 18.3 (restrooms). The Brighton ski area is on the right at mile 18.5. All along the loop, watch for entering and exiting motor vehicles. The highway crests at mile 18.6., and the loop ends at mile 18.9. The return trip (out-and-back route) begins with a rapid descent of the canyon.